I know what you’re thinking: Eating before bed is a terrible idea! In general, eating large meals right before bed is a concept both Eastern and Western medicine agree upon. The movement of food through our digestive system is helped along by the things we naturally do during the day, such as being vertical and moving. However, Chinese medicine is always promoting food as the first method of intervention. Depending on how sleepless nights manifest, there are snacks you could try a couple hours before bed to help you sleep the whole night through. If you fall asleep pretty easily, but have trouble staying asleep, the following paragraph is for you. This type of pattern will often manifest as a restless sleep, tossing and turning a lot, waking frequently, and in general feeling like you cannot get comfortable or settle into a deep sleep. About two hours before bed, you could try having a a ‘heavier’ food such as a small bowl of plain yogurt, or a piece of toast with peanut butter on it. Half of an avocado could also be a good choice. The idea is to eat a small snack that is good for building the physiologic ‘Yin’ in the body. We all have both Yin and Yang in our bodies, but having enough Yin helps anchor us to sleep through the night. If you fall asleep pretty easily but wake in the middle of the night wide awake and cannot go back to sleep for hours, the next round of food ideas are for you. It’s important to know that sometimes a spike in blood sugar levels before bed can cause one to wake up a few hours after falling asleep and feel wide awake. If you are in the habit of drinking alcohol with dinner, it may not be working for you as a regular routine. If you are in the habit of eating ice cream after dinner, it may not be working for you as a regular routine. Try having a more complex grain with dinner, like quinoa, brown rice or multigrain baguette with your steamed vegetables and small protein. The combination may be helpful in regulating blood sugar levels while you sleep. If you must have something sweet after dinner, try small amounts of fresh fruit with a handful of nuts. If you cannot comfortably lie flat to fall asleep because you have acid reflux and therefore cannot fall asleep, here are some food thoughts for you. In general, this is considered to be a ‘food stagnation’ pattern in Chinese medicine and you may need to look at restructuring your meals throughout the day so you take in larger meals at breakfast and lunch and keep your dinner time foods small in portion and easy to digest. The person with this pattern would benefit greatly from eating bone broth with mung bean noodles and steamed vegetables for dinner. If changing your dinner time menu is not really an option, choose to have either grains or starch with cooked vegetables OR a small portion of meat with cooked vegetables. Basically, choose grain with veg or meat with veg, but do not eat grain/starch with meat. The combination is difficult to digest late in the day. About two hours before bed, try having a small mug of bone broth. The benefits of bone broth healing the lining of the esophagus and gut are well known. It takes some sustained commitment, but it’s also delicious. Over time, the evening mug of bone broth will soothe an irritated esophagus. You can also try your favorite herbal tea with a teaspoon of honey. Honey also has the effect of healing the lining of the esophagus. If you lie awake for hours but cannot fall asleep, try having a big bowl of oatmeal or simple pasta or a few pieces of toast about 2-4 hours before bed. The latest sleep research suggests that carbohydrates which quickly raise blood sugar (those with a high glycemic index) may hasten sleep. These types of carbs may boost tryptophan and seratonin, two brain chemicals required in the process of falling asleep. Enjoy a hearty bowl of carbs (guilt free) and then hop on the sleepy train as soon as you feel it coming. If you try these food suggestions and do not notice a significant change in your sleep, please make an appointment with your local acupuncturist. There are wonderful acupuncture protocols and very effective herbal strategies for restoring healthy sleep patterns. Julie Baron is an E ast Asian Medicine Practitioner at the Thompson Family Acupuncture Clinic in Walla Walla, WA. Julie seeks to empower individuals and communities. As a movement and mindfulness educator, she has a penchant for functional anatomy. As an EAMP, she has also has a passion for herbal medicine. Pleased to meet you! We are a team of East Asian Medicine Practitioners (acupuncturists and herbalists), who love whole foods, love looking at tongues,feeling pulses and helping people understand a bit more about their own bodies. Come join the ride to a different perspective on health. CHINESE NUTRITION VIDEO SERIES AVAILABLE NOW! 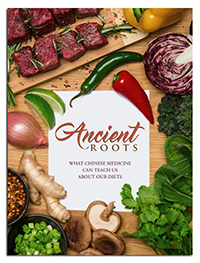 Learn how to heal yourself with food, while empowering yourself with the knowledge of Chinese medicine. Our 6-part video series will teach you how to take control of your health and feel your best by using simple ingredients, cooking styles, and real food as your first medicine. Available in Digital Download or DVD. Action needed! Help your friends in pain get better acupuncture coverage.